COMPLETE THE AAIE INTERNATIONAL SCHOOL LEADERSHIP CERTIFICATE IN LESS THAN 12 MONTHS WITH AFFORDABLE AND CONVENIENT OPTIONS FOR A MASTER OR DOCTORAL DEGREE IN LEADERSHIP WHILE WORKING INTERNATIONALLY! The AAIE International School Leadership Certificate is designed to ensure you learn and can apply the unique leadership and management skills to successfully lead an international school within our complex global setting. Take the first step in furthering your leadership career and gain valuable educational leadership expertise while working from anywhere in the world. Below is more information on this unique program. Take your first step today! 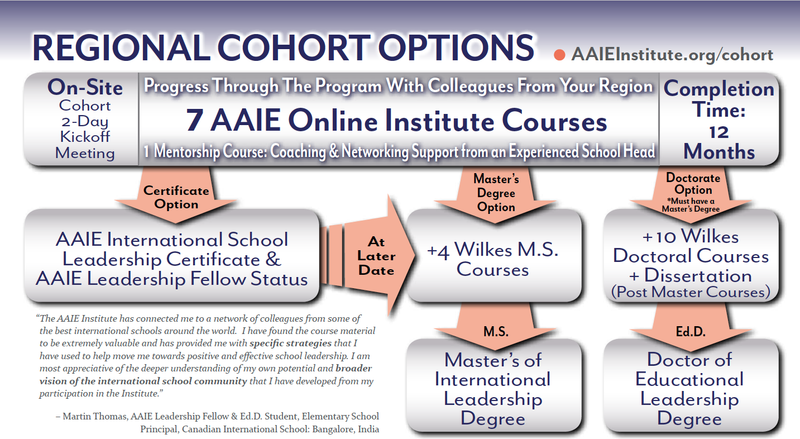 The AAIE International School Leadership Certificate Program was created by AAIE with input from highly experienced and respected International School Heads in partnership with Wilkes University to prepare you to successfully lead within the dynamic international school setting. Leadership alone, however does not prepare you for this challenging role! Connections with other leaders within your regional and a strong global network of diverse international school colleagues will help ensure you have the resources, support situational experience and practical know-how to reach your professional goals and lead well. WHO WOULD BENEFIT: All international school leaders and those looking to gain a leadership role within the international school setting. This may include the Head of School, Principals, Assistant Principals, Curriculum Leads, Technology Leads, Department Chairs, Grade Level Chairs, and any educator wanting to affordably gain a high quality and practical Leadership Certificate, Master or Doctoral degree while working internationally. We provide the ONLY program designed by and for international school heads that includes an experienced international school head as your mentor throughout the program. The Certificate is comprised of eight courses designed for emerging or current principals, heads of school and others interested in gaining the knowledge and credentials to successfully lead and forward their career within the international school setting. Tuition pricing is very low for the certificate program to encourage teachers and those not yet in administrative roles to complete the initial credential needed to secure their first leadership role, with the flexibility to upgrade to graduate credit for a Masters or Doctoral Degree at a later date. GRADUATION: All program graduates are invited to receive their International School Leadership Certificate Plaque and be recognized as an AAIE Leadership Fellow in person at the 53rd AAIE International Leadership Conference and Expo in San Francisco, California that takes place 4-6 February 2019. Those who choose to move forward with a Masters or Doctoral Degree will have the option to complete their degree with a cohort. This program offers a uniquely affordable and timely way to also gain a Masters in International School Leadership or a Doctor of Educational Leadership degree while working overseas. **See flow-chart below for additional course requirements or contact us to find out more! "The program has given me a chance to not only professionally connect with colleagues around the world in other schools, but also to share advice and experiences as we grow in our own leadership roles. The coursework is extremely relevant, and has sparked many new initiatives and professional conversations between myself and the other administrators at my current school. I highly recommend this program to any administrators working in, or hoping to work in an international school."